Lisa Rosinsky is this year’s Associates of the Boston Public Library Writer-in-Residence. For so many writers, the path to success is circuitous. Some fall into a writing career inadvertently, while others who long work to “make it,” get discouraged by rejection, writer’s block, or the punishing publishing industry. Not so for Lisa Rosinsky. 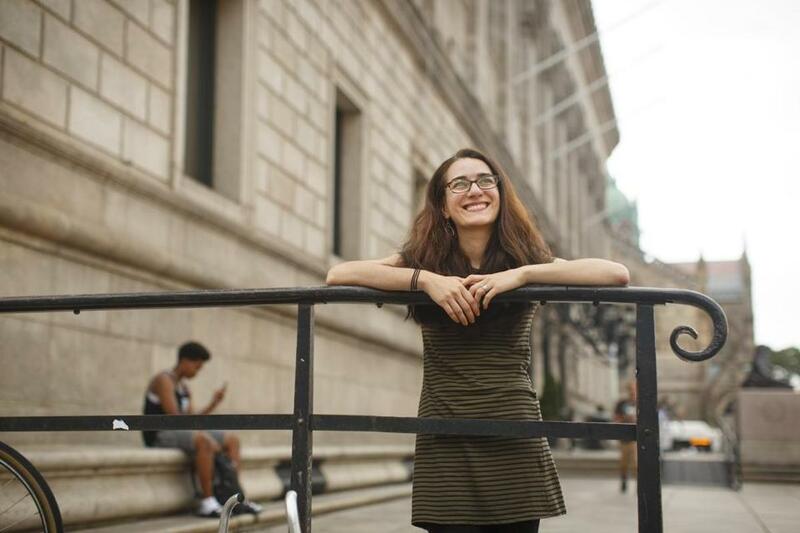 With the exception of a stint as a premed student, Rosinsky, 28, has been steadily working toward becoming a writer since fourth grade, when she went well beyond the parameters of a simple assignment. When her teacher in Clarksville, Md., asked the class to write short stories based on images from a picture book, Rosinsky filled a whole composition book. And she didn’t stop there. “I went on to write six other chapters and an epilogue, which took me until the end of sixth grade. It was a couple hundred pages all typed up,” said Rosinsky, who lives in Jamaica Plain. Coincidentally, she recently heard from that teacher for the first time since elementary school, and had two huge announcements to share. In the same week in June, she’d learned that her debut young adult novel, “Inevitable and Only,” would be published by Boyds Mills Press in 2018. 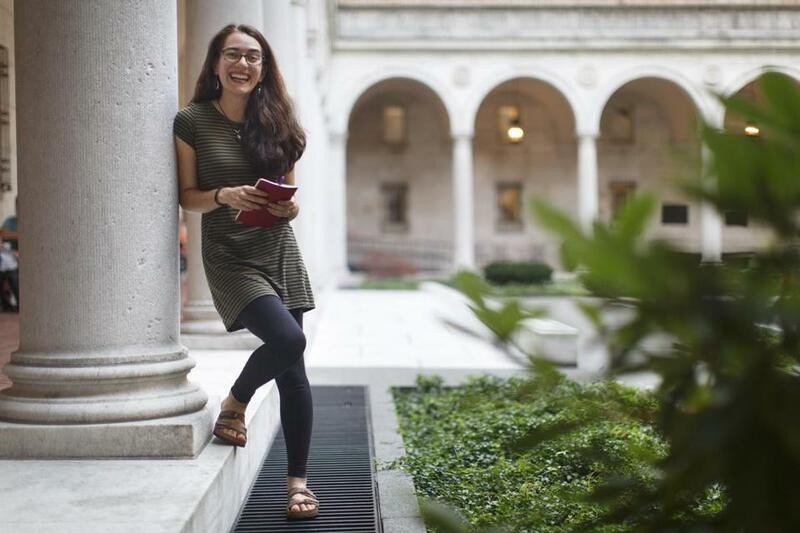 She’d also been selected as this year’s Associates of the Boston Public Library Writer-in-Residence, a nine-month fellowship for emerging children’s or young adult authors that comes with office space at the library in Copley Square and a $20,000 stipend. A panel of authors, librarians, and other publishing professionals selected Rosinsky for the position based on the strength of her proposal for the YA novel “Robin and Mariana,” which she describes as a “queer, modern-day ‘Robin Hood’ retelling about privilege, social justice, and survival.” As a self-described queer author and lifelong “Robin Hood” fan drawn to fairytale and myth retellings, Rosinsky has always wanted to retell the legend as a story between two girls — Robin and Mariana. There’s something particularly powerful, she said, in LGBTQ retellings of traditional tales. The library’s writer-in-residence program has launched the careers of an impressive list of writers since 2004. Could Lisa Rosinky be next? Rosinsky is well prepared to take on the task of writing another novel. She studied creative writing at Johns Hopkins University and made her way to the Bay State to work on her MFA in poetry at Boston University in 2015. Now working as an editor at Barefoot Books in Cambridge, she continues to write, penning poetry, short stories for children, and “Inevitable and Only,” which she wrote while working at the children’s magazine Highlights after college. In the book, Robin and Mariana meet a number of homeless youths not so unlike Robin Hood’s band of Merry Men. The characters grapple with issues of prejudice and oppression related to gender, sexual orientation, race, and class. Knowing she wanted to explore these intersectional social identities as well as the subject of youth homelessness, which is particularly prevalent for LGBTQ teens, Rosinsky thought “Robin Hood” was the perfect — and timely — vehicle to tell that story. Anita Silvey, author of “Everything I Need to Know I Learned From a Children’s Book” and a judge for the Writer-in-Residence fellowship, said she was left wanting more after reading Rosinsky’s proposal and first chapter. Supported by the Associates of the Boston Public Library, an independent nonprofit dedicated to preserving the library’s special collections of rare books and other items of literary and historic importance, the Writer-in-Residence program is underwritten by an anonymous donor. It has launched the careers of an impressive list of writers since 2004. Elaine Dimopoulos, Hannah Barnaby, Anna Staniszewski, Annie Hartnett, and Natalie Anderson are among former fellows who have titles that are forthcoming or were published in recent years. Eryn Carlson can be reached at eryn.carlson@gmail.com.